Hike today announced the launch of a special sticker pack on the occasion of Ashadhi Ekadashi, an important religious festival celebrated to pay homage to Lord Vishnu, the preserver as per Hindu mythology. Legend has it that Lord Vishnu who had fallen in deep sleep for 4 months woke up on this Ekadashi celebrated on July 23rd. The festival is celebrated with a lot of grandeur and pomp across different parts of India. Stickers are one of the most loved features of Hike. Hike offers a library of over 20,000 stickers in 40+ languages. Multiple genres are covered across 1000+ sticker packs which highlight the colorful, cultural landscape of India, Bollywood, comedy, festivals, cricket, kabaddi, local catchphrases, emotions, and even excuses. There is also the nifty text-to-stickers feature on Hike chat that can turn any message you type into a fun sticker. Stickers are expressive and a great way to say what you feel. 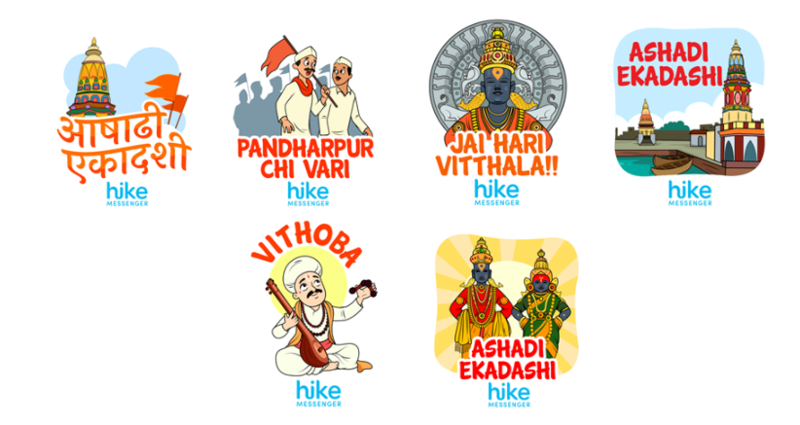 Hike’s most popular stickers reflect love, laughter, and fun followed by festivals and regional references. Over 300 million stickers are exchanged every day! To make your conversations more expressive, simply download the Hike app from the App Store or the Play Store. Navigate to the Sticker Shop and search for sticker packs.